As I get older, the memories of my past seem to fade away faster and further out of reach. It is harder to remember the names of people I once knew well and difficult to recall when certain events happened in my life. It is this passing of time that makes the tough times fade, but it is also more difficult to hold on to those special memories and moments I hold dear in my heart. Some of the strongest memories that I have of my childhood revolve around Christmastime. I am not really sure why this is, but it might have something to do with the Christmas ornament collection that has been handed down through my family since my grandmother was a child. With every Christmas ornament I hold and place on the Christmas tree each year, I am reminded of the special things we did the year we added that particular ornament to the collection and recall the stories my mother and grandmother used to tell as we decorated the Christmas tree when I was a child. From my great-grandmother to my mother to me and someday to my own children, our family Christmas ornament collect has grown both in number and in my heart over the years. When my great-grandmother came to the United States from Germany at the start of the 20th century, she must have felt so alone and homesick for her family that remained back in Germany and the way of life she left behind. As a young teenage girl arriving at Ellis Island in New York, she must have felt as if she had traveled to a different planet. With its tall buildings and bustling city life, even a hundred years ago New York City was a large and imposing city, especially for a young girl who did not even speak the language. From what I understand, my grandmother moved in with a cousin whom she barely knew and immediately began working in the factories and learning how to speak English. All alone and feeling quite lonely, I am sure, she celebrated her first Christmas away from her parents and homeland. I cannot imagine what this must have been like. To picture a teenaged girl today leaving her home and her family to work in a foreign city without even understanding the language or the culture seems literally impossible. My great-grandmother did it, however, and in just a few short years she was married, had a child, and was living the life of freedom her parents had so desperately wanted her to live in America. When my grandmother was a child, she told me that her mother (my great-grandmother) would cry every Christmas as she thought about her own parents back in Germany and how she knew she would never see them again. One Christmas, however, my grandmothers father gave her mother a beautiful mouth-blown, hand-painted glass ornament that had been made in her home country of Germany. Her father (my great-grandfather) had purchased it at a local shop in New York City. It was a little glass angel with a harp that was painted a bright blue and gold color. This was the very first Christmas ornament that would eventually grow into the family collection I now have in my own home. The little glass ornament that came from her own home in Germany must have made her feel like she was connected with her family back home because from that Christmas on my great-grandfather would buy her a new ornament to add to her collection each year. Instead of crying, my grandmother said her mother would smile with joy as she placed each new ornament on the tree and told her stories of what it was like growing up in Germany as a young girl. When my grandmother grew up, got married, and gave birth to my own mother, my great-grandmother passed on her precious Christmas ornament collection to her. At first, my grandmother did not want to take it because she knew how much it meant to her mother. However, my great-grandmother told her that passing on the ornaments to the next generation made her feel that her own parents and memories would be passed on as well and never forgotten. More and more Christmas ornaments were added to the collection over the years. There were glass ones and wooden ones and even some plastic ones, but the ones that remain the most special are those that carry along with them a special story or meaning to them. For instance, on the year that my mother was born, my grandfather bought a little gingerbread house ornament that was painted brightly in a rainbow of colors. When my uncle was born, my grandfather bought a little choo-choo train ornament. Whenever I look at these ornaments I think of the joy my grandparents must have felt at the birth of their own two children. As a child, I remember hearing all the stories that went along with the Christmas ornaments that were in our collection and every time I placed a new one on its hook and selected a place for it on the Christmas tree I was thoroughly fascinated with the stories and history that went along with each and every one of them. Today, the family Christmas ornament collection has been handed down to me. Remembering the stories and thinking about how my children will eventually tell their children the stories that have been handed down since my great-grandmother was a teenager always brings a tear to my eye. It is an awesome responsibility that I take very seriously and hope will continue on for generations. This year I will be adding my very first Christmas ornament to the collection as the newest keeper of the collection. With so many designs to choose from, I am not really sure what to pick. Knowing that it will carry along with it the memories that I hold today about this years Christmas makes it a difficult choice to make. I have got my eye on a beautiful golden Santa ornament, but I am just not sure which one to pick. Once I make my choice, however, I will know that I am making my great-grandmother proud and the memories that she held and we all hold will live on forever in our very special family Christmas ornament collection. Visit ChristKindl-Markt.com A German Christmas Market and European Gift Shop. 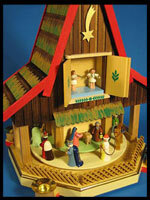 German Made Pyramids, Nutcrackers, Smokers, Christmas Ornaments, Figurines, Cuckoo Clocks and Music Boxes.